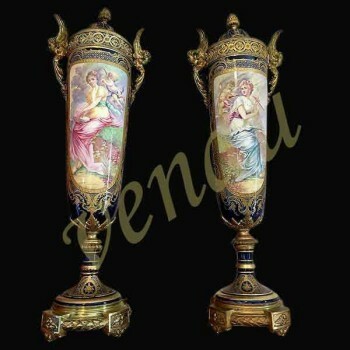 It was at the initiative of Madame de Pompadour that the glassware of Sèvres appeared in 1750. However, it is under the reign of Charles X that the establishment stands out, thanks to its famous opalines. They will become jewels of the crown, as well as wonderful gold and ruddy coins presented at the Universal Exhibition. In a century and a half, Cristal de Sèvres and its luxurious glasses have definitively conquered the art enthusiasts of the French table: the aesthetic in the air of the time of the pieces produced and their timeless elegance add to a work of the crystal without Equivalent. The different Crystals series of table glasses share a refined appearance, sublimated by the subtle transparency of the crystal used. Today Cristal de Sèvres perpetuates Madame de Pompadour's desire to create sober and elegant collections, precious and exceptional objects. The Cristal de Sèvres collections are recognized "at first glance", it is a perpetual game between the edges confronted with curves, the thickness and the finesse, the transparent and the opaque, which reveals all the brilliance and brilliance of its crystal in a Landscape of complicit contrasts.